He was so excited that he laid out his clothes 3 days ago for this morning’s outing. That’s the thing about living on the spectrum – we like to plan in advance. Actually, we’re lucky today even happened because we almost didn’t get to do the big event. If it hadn’t been for the extra work of two precious men who choose to see beyond our restricted vocabulary and arm flapping, I’d probably be managing a major meltdown this morning due to “change of plans”. I hate it when we change our plans. It leaves me feeling like I’ve been hit by a bus. The countdown started on Thursday night: “only two more sleeps (as in a night’s sleep in Noah language) until the best day ever”. Then on Friday morning: “I can’t wait until tomorrow. It’s gonna be the best time ever.” So with our favorite shirt, our most comfortable shoes and Winnie the Pooh we head out into our adventure. As I cited in my last post, Noah has become obsessed about the food ministry at church. He “helps” take donations each Sunday morning by greeting church members ever so warmly at the door with “hey…where’s YOUR canned fruit?” (Mental Note: screen for autism among the greeters at your church…I’m just sayin’) Each week he helps stack and count the contributions. He has also been part of the decision making process for each week’s featured donation item. I imagine in some way this has helped him order his environment at church. But, oh, if only this perseveration was restricted to the church building. In addition to shopping on Sunday afternoon – that’s right, the WORST time of the week to grocery shop and thereby, loose your anointing – for this week’s item, Noah has solicited donations from family members and friends. He just cannot understand why everyone has not caught on to this exciting phenomenon. So this morning, we visited the Food Co-Op and delivered donations. One of those sweet men who’ve so kindly adopted Noah called the ministry ahead and told them about Noah. The director of the Co-Op was so happy to hear of his interest (that’s a mild way of putting it I think) that she made plans to give Noah a personal tour of the facility. My only prayer was that we would not make a bigger public spectacle of ourselves than we usually do – on a scale of 1 to 10 (10 being “wow, did you just see what they did”) we typically average out at a 7. 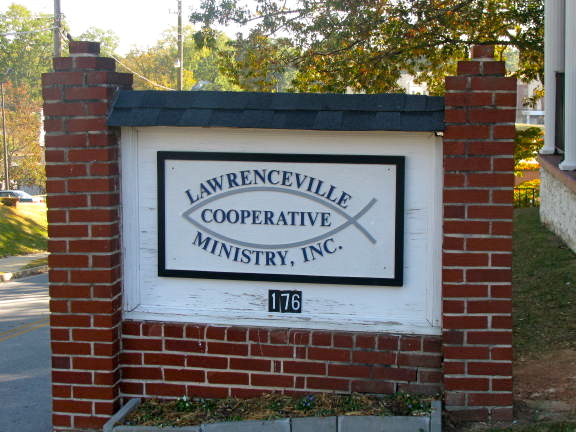 We couldn’t even get in the parking lot of this modest church in Lawrenceville. Mike had warned me that it would probably be crowded and noisy on a Saturday morning. Noah had actually asked me on the ride up, “So mom, what exactly will this be like?” It has probably only been in the last year and a half that I ever dare take Noah anyplace I have not scouted out previously. I would always have to report how it smelled, the noise level, and lighting conditions to him before we ventured anyplace new. Well, this morning I couldn’t do that so I answered, “Well, Buddy. I’ve got no idea.” His response was typical Noah: “Well, this will be something to remember then, huh Mom?” My first thought was, “dear God I hope not”. 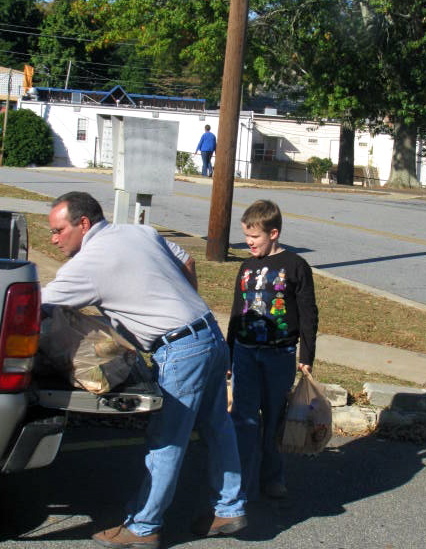 After Noah helped Mike carry in about 10 bags of groceries (the heavy work was very good occupational therapy before the noise, sights and smells…thanks for that Lord – wouldn’t have though of it), Noah was greeted by the director. He couldn’t make eye contact, but offered her a very flappy hand shake. She was warm and wonderful and put Noah at ease immediately. It is obvious that she is practiced at (and has perhaps perfected) the art of restoring dignity to the broken. So she began to take Noah through the building. She explained the in-take process and when he loudly asked, “Hey, who are these people?” she calmly explained that they were waiting to go back and get their food. She even took Noah through the offices there and showed him her filing system and explained how they manage helping so many people. He insisted, of course, checking the S file cabinet to see if we had a file. She was un-phased by his questions and requests. She introduced Noah to everyone as if he were a celebrity. Noah dutifully gave each volunteer the same view of the top of his head, and flappy hand shake. No one seemed to think anything of it. At one point I heard her gently explaining to Noah that giving is a way we can be “the hands and feet of Jesus for people who need his help”. Noah said very little, but was his usual stealthily observant self. I allowed him to bring the camera so that he could take pictures. I thought maybe it would quench some of his interest, truth be told. When we got back to the rows of food, I could see him mentally inventorying the shelves. I allowed him the camera and he began snapping away. I was dismayed to find him reading the labels on the empty shelves. Sure enough, later in the car he was able to tell me everything they were out of. His biggest excitement was seeing a table set aside for baby food and formula. Mike had given him a list of the Co-Op’s Top Ten needs. Noah read them silently until we reached the interstate. 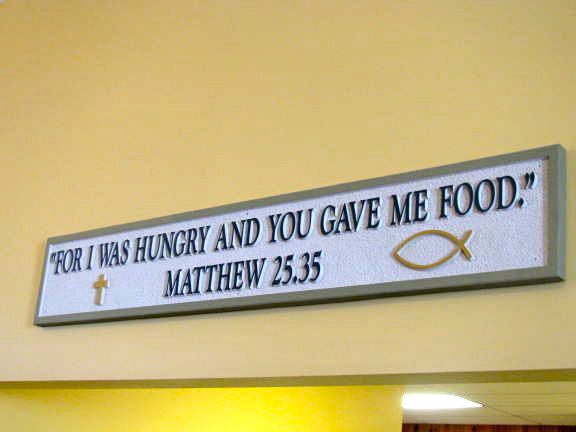 Somehow I don’t think today quenched Noah’s desire and passion for the food ministry. Instead, we may have just created an all hands and feet monster that might go through your pantry should we stop by your home to see if you have any of the featured donation of the week. Everybody lock up your toilet paper.